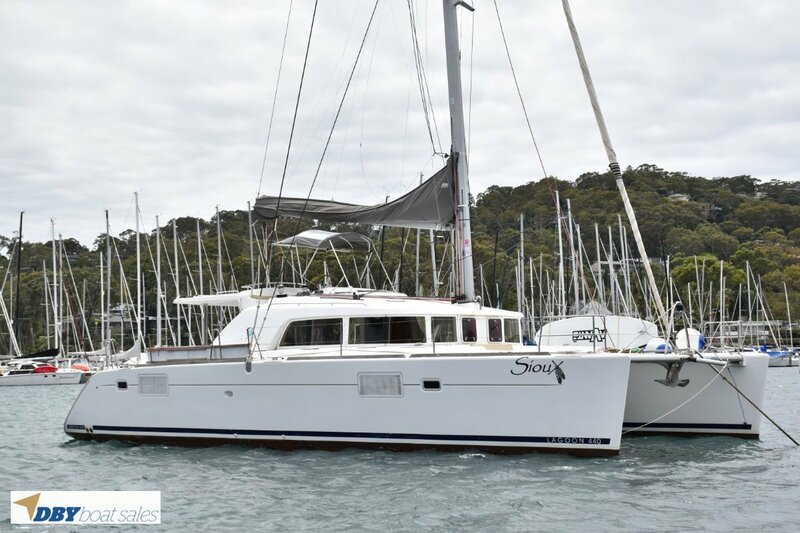 This amazing and rarely used 2009 example of an extremely popular design of the Lagoon 440 Catamaran is now for sale in Pittwater. It has only 1000 hours on the upgraded 54 hp Yanmar diesel engine which runs like a dream. A fly bridge steering station gives great all around visibility and seats 5-6 people. 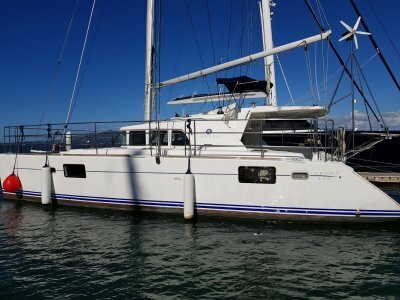 It has a bimini for great shade cover with front screen. The interior helm station has joy stick and engine controls. The plush and spacious main cabin is light, airy and functional. She features reverse cycle Air Conditioning. The design of the boat ensures great ventilation with opening hatches generously placed throughout for your comfort. A generous cockpit with an abundance of seating in its u-shape design ensures comfortable entertaining. An extensive array of electronics including, radar, dual GPS plotters and AIS and Auto pilot. 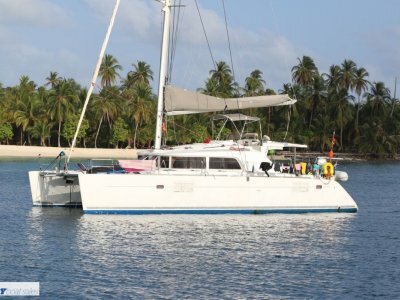 Other features include a 2017 dinghy with 20hp Honda outboard, 2 x 320W solar panels, helm anchor up/down control, Fisher Panda Generator, Watermaker and symmetrical spinnaker. 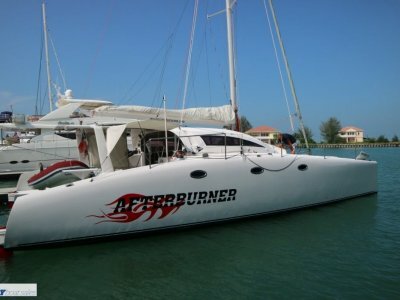 This beautiful Catamaran awaits your inspection and will not disappoint. Engine Notes : 2 x 54 HP Yanmar 4JH4ACE diesel engines. Controls at both upper and helm and navigation station. All regularly serviced. 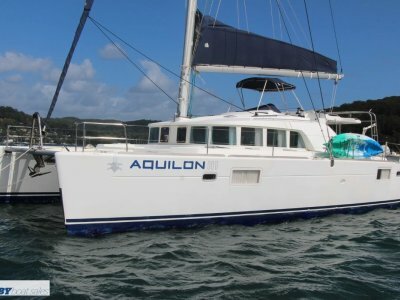 Accomodation Notes : 8 Berths in 4 double cabins. Galley Notes : Cooker with 3 burners and oven plus a microwave oven. Includes a double sink in galley freezer and fridge in salon. Refrigeration : Fridge and Freezer in galley plus 1 x fridge in cockpit. Entertainment and Appliances Notes : Radio/CD player with loudspeakers in and outside. Video/DVD player. Anchor / Winch : 5 winches - 2 x Harken 50 dual speed, self tailing electric genoa winches. 1 x Harken 50 dual speed, self tailing electric mainsheet winch. 1 x Harken 46 dual speed, self tailing electric halyard winch. 1 xElectric Harken 40 dual speed, self-tailing winch for davits. Mast/Rigging : Sloop rigs with slab reefing main with lazybag. Furling Genoa. Electrics : 12 V + 220 V. 4 x 150 Ah domestic batteries -. 2 x engine start batteries 1 x Generator start battery 2 x engine alternators Battery charger/invertor. Electronics Navigation : Plastimo Steering Compass. Raymarine ST70 Graphic display at Nav station. Raymarine E120 LCD screen at Nav station. Raymarine ST70 Graphic display at helm. Raymarine E120 LCD Screen at helm. Raymarine ST70 Tridata at Helm. Raymarine ST70 wind at Helm. Raymarine ST8001 auropilot with displays at Helm and Nav station. Wireless remote for autopilot. Raymarine 4Kw Radar. Raymarine joystick at nav station. All Raymarine instruments are Seatalk interfaced. Safety Gear : 4 x fire extinguishers. Horn. Ground Tackle : Main anchor with 100m of 12mm chain. Quick electric windlass.